Lucy Black Quilted PVC Coffin Backpack with Spiders by Rock Rebel [HB80LUCYBLACK] - $59.99 : Mystic Crypt, the most unique, hard to find items at ghoulishly great prices! 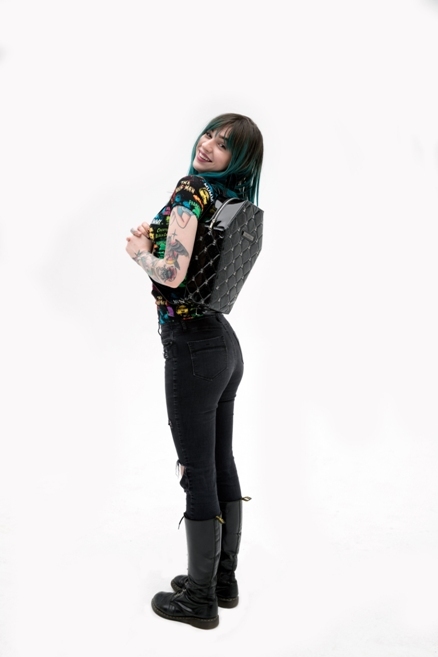 This coffin-shaped Vegan PVC backpack from Rock Rebel features a black glitter quilted design with silver tone spider hardware. Shiny Black Glitter vinyl PVC accents the purse. Yes, we said coffin-shaped. Inside has black and white spiderweb printed lining and Rock Rebel label. There is a long velcro pocket inside. Zipper closure. Adjustable straps. (straps will adjust from 22 inches, all the way up to 38 inches) Made of black shiny Vegan PVC pleather material. This backpack purse measures 14 inches tall, 9 inches wide, and 4 1/2 inches in depth, very roomy. Find more Gothic Purses, Coffin Purses, Gothic Messenger Bags and More at Mystic Crypt!